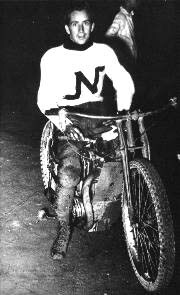 Keith "Buck" Ryan, Aussie Test rider and International, won the Australian 3 lap Solo Championship at the Royale in 1952. Keith is shown here in his Newcastle (NSW) jersey. 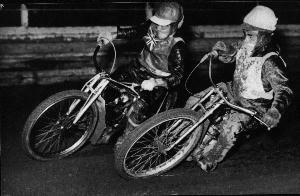 In his later years now and Keith is a great supporter of Australian Junior speedway. 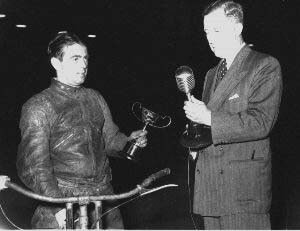 Australian pioneer solo rider Frank Dolan receives a trophy from Empire Speedway P/L Director, John Sherwood. It was always said that nobody could run the Royale like John Sherwood did. Frank was Australian Solo Champion in 1946. 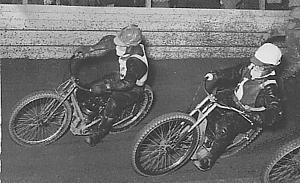 Two of the most exciting, consistent and entertaining riders I have ever seen, Left the fabulous Aub Lawson and right, Lionel "Porky" Levy. 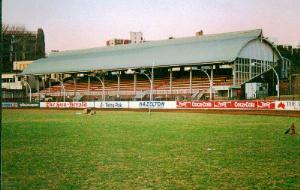 Lionel was also known as "The Mighty Atom". 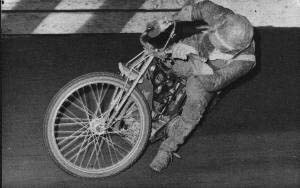 He won the Queensland Solo Championship in 1950 and held the 3 lap Solo record at the Royale for many years. Lionel lost his life in a "comeback" at the Royale on 10 - 2- 1968. Bill Bryden. Bill worked his way up through the ranks to become an "A" grader at the Royale. He won the NSW Solo Championship in 1959. Young Englishman, Arthur Wright toured with the European team in the 1950s. Up and coming riders from Europe considered riding at the Royale an important part of their apprenticeship and quite often went back to England much better riders for the Australian experience. Another spectacular Englishman to ride at the Royale, Mike Broadbank. 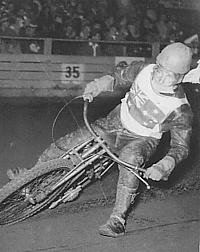 Mike was a Test rider for Britain in the 1960s. 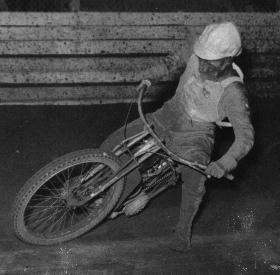 He won the 1962 Australian Solo Championship. Three of the Royale's young guns. From left, Greg Kentwell graduated at the Royale, went on to a Test and International career in Solos and drove a midget as well. In 2001 Greg is still keen and is looking for a vintage midget to restore and drive. "Mr Royale" himself, Jim Airey a master of the circuit and a champion both here and overseas. Jim had his first ride at the Royale on Saturday the 6th October 1962. He rode from the Gate in a Novice Handicap in a field of six with the backmarker Johnnie James on 20 yards. Jim won his first race in a time of 68 seconds for the 3 laps. 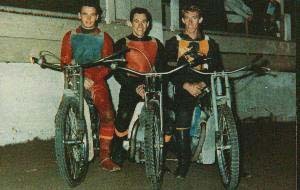 ( the 3 lap record was 59 secs, held by Jack Parker and Lionel Levy). Gordon Gausco (right) was a mate of Jim's and Gordon had his first ride at the Royale on Saturday, February the 2nd 1963. He started from the Gate in a field of six in the Encourage Solo Handicap and won his first race in a time of 73 - 3/5 seconds. Gordon lost his life at Liverpool Speedway (NSW) on the 8 /11/ 1970. A new page just started, click here for SOLOS at the Royale 3..
Victorian Jack Biggs, Jack was an accomplished Australian Test rider and International. He rode for Harringay in England and lost his life at Bendigo Speedway, Victoria on the 9-12-1972. In the World Solo Finals Jack was placed 15th in 1950, 3rd in 1951, 16th in 1953, and 9th in 1954. Jack Chignell, along with Noel Thorley one of the greatest handicap riders the Royale has ever seen. 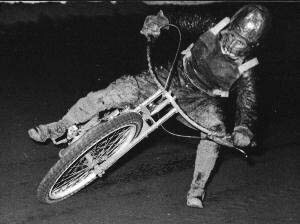 Jack rode for Belle Vue in England and was a great crowd favourite where ever he rode. 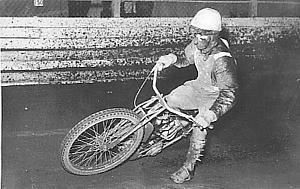 Allan Quinn an Aussie Test rider and International, a team mate of Jack Biggs at Harringay. 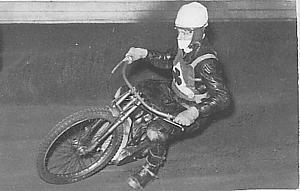 Allan started out as Aub Lawson's mechanic and is a founding member and was the first President of the Veteran Speedway Riders Association of Australia. 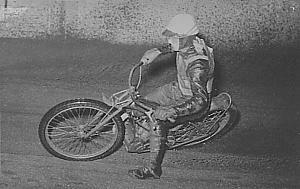 Don Lawson, younger step brother of Aub and also a Test and International rider. Don rode for West Ham in England and sometimes for a bit of fun he wore a Donald Duck breastplate. Always immaculate in leathers and bike. Two fabulous entertainers, Englishman and Test captain Jack Parker heads Aussie Lionel "Porky" Levy plus somebdy else, I wonder who that was ? What can you possibly say about these two? Aub Lawson and Jack Young. 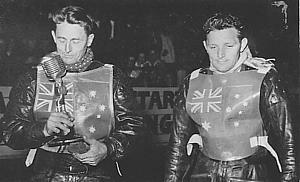 Young was twice World Champion, 1951 and 1952, 5th in 1953, 4th in 1954, 6th in 1955, and 10th in 1960 South Aussie Jack Young. Some say the greatest Australian rider of all time. Take note of the magnificent presentaition of their leathers.